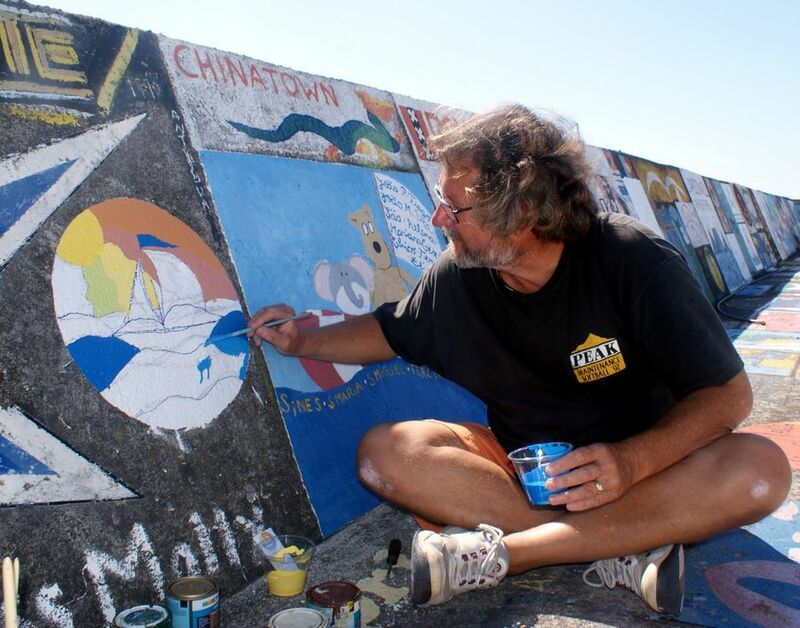 When cruisers think of the Azores, I suspect they visualize the marina at Horta and its famous wall paintings. Certainly, that's what we thought of. Yet, as we studied the charts and read the little bits we could find online and in our cruising guides, all of the islands of the archipelago seemed to merit exploration, and we decided to spend some time visiting them rather than simply re-provisioning, repairing things, and resuming our Atlantic crossing. We managed to visit four of the seven islands before it was time to move on. 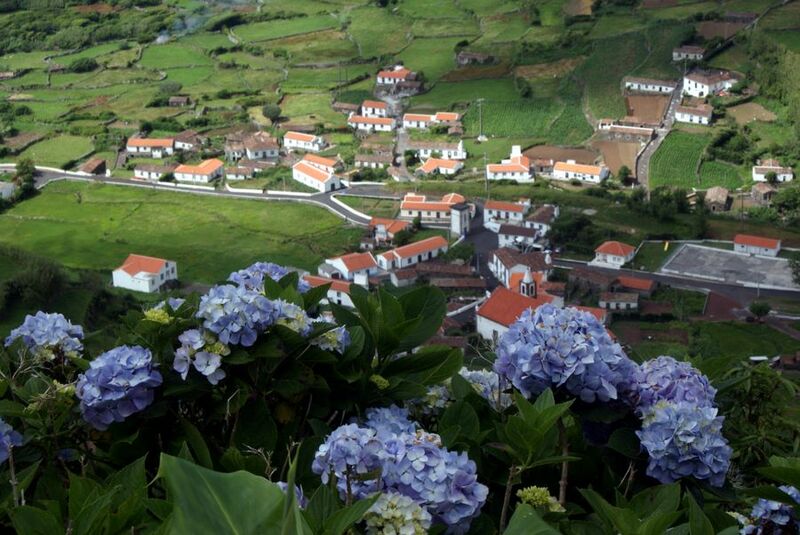 Flores is the western-most island in the Azores. According to one brochure we picked up, Flores was named for its flowers. We picked it as our first landfall, and 25 days after leaving Fort Lauderdale we anchored in the harbor at Lajes das Flores. (Lajes is a common name in the Azores, and to keep the towns straight, you need to add the island to the name.) There to greet us were fellow SSCA associates Richard and Andrea Black on Saeta, another Sceptre 41 from California. Although you can tie up at the quay without charge unless a ship is expected, the anchorage inside the jetty is sheltered and quite comfortable. Dinghies tie up to the wharf at the steps closest to town by the boat ramp. Restrooms and cold-water-only showers are in a single-story building just up from the steps. One door in the building is marked for laundry, but it was always locked when we were there. A fresh water tap is located across the ramp from the steps, and many cruisers simply wash their clothes right there. Follow the winding street on up the hill to reach Beira Mar and Paula's Restaurant. Paula has moved to São Miguel, but she has a tenant running the restaurants. This is a favorite stop for beer or wine and food and information. The current proprietress speaks a little English and can call a taxi for you or give you directions to the car rental agency near the lighthouse. This is also a pick-up and drop-off point for the local laundry service, which is a little expensive, but there are no launderettes in town, so it's the only alternative to buckets by the tap at the boat ramp. After three plus weeks on the crossing, I figured we could splurge a little. Unfortunately, Beira Mar does not have Internet access, wireless or otherwise, although Paula used to offer a wireless hotspot and is encouraging her tenant to start it again. For access to the Internet, go to the library at the main intersection up the hill. There are several computers available for use for free, and there is also wi-fi if you choose to bring your laptop. There are two grocery stores further up the hill near the gas station. The library has a map posted that shows them. There's a third grocery store just outside town on the way to Santa Cruz, but you need a car to get there. The car rental agency near the lighthouse also has maps and brochures. Car rental is inexpensive (30€/day), and it's the most practical way to explore the island. Some taxis also offer tours, but on Flores most—if not all—taxis are based in Santa Cruz, where the airport is. We shared two days' rental with Saeta and found it well worth the expense. You can't imagine the miles and miles of hydrangeas, cannas and wild roses that line roads until you see them. The steep volcanic peaks are terraced by fields bordered by stone fences, and those fences too are trimmed with hydrangeas. The lakes of the interior are in calderas, some with waterfalls. Unless you're up for a strenuous hike, ignore the signs to the hot springs. Once you get there, the hot springs themselves are disappointing, about the size of a little bathtub. Fuel and water are available by jerry can: water from the tap by the boat ramp and fuel from the service station up the hill. We also saw a fuel truck pull up to a mega-yacht while we were there, so it is possible to have large quantities of fuel delivered. After nearly a week at Flores, we continued on to Horta, about 140 miles away on the island of Faial. The cruising guides say that the marina at Horta has berths for 300 yachts. That's counting the raft-ups. Along the jetty walls, the yachts raft up three deep at the peak of the season. Almost every concrete wall and surface of the marina at Horta is covered with paintings done by boats that have stopped here. It's a tradition to leave a painting behind to commemorate your voyage. Some cruisers bring their paint with them. We didn't, but paint is readily available from the hardware stores near the marina, and it's also tradition to leave your leftover paint for others. Electricity and water are included in the moorage rates. Even with the marina full, we were able to find a hook-up to connect to shore power because most of the boats that started from the US or Caribbean weren't equipped to use the European power. Mid Atlantic Yacht Services (MAYS) sells transformers, but it's a very expensive place to buy them. Thanks to Jack and Patricia Tyler's excellent articles on preparing your boat for Europe, we purchased a transformer in the US on eBay before we left and only needed to buy the electrical cables at MAYS in order to plug in. We also bought hose fittings at MAYS so that we could fill our water tanks. The people at MAYS all speak excellent English, and they're very helpful in answering all kinds of questions. They're located just across the street from the marina's shower building, so they're easy to get to as well. We needed to have our mail forwarded to us in the Azores because our boat documentation expired at the end of June and the new certificate didn't reach our mail forwarder before we left. It took two weeks for it to reach us in Horta using USPS priority mail, and we're told that is normal. We were advised to use USPS because none of the other shipping services have offices in the Azores making the postal service is marginally faster. The bottleneck is that all mail goes to Lisbon first. Then they put it on planes to Horta if there's room. There are no dedicated freight flights, and passenger planes are usually full during the short tourist season, so it often takes days for the mail to complete that leg. Horta is a charming town with good provisioning at the Modelo supermarket up the hill and at the smaller stores and open market nearer the marina. There are lots of restaurants, but the cuisine isn't exciting, so we usually chose to eat on the boat. Beer and wine at the restaurants and pubs is reasonably priced, but it's a really good deal at the stores. We were surprised at the high quality of inexpensive Portuguese wine and bought a mixed case to take with us when we left. You need a car to see the island beyond Horta, and car rental agencies abound in the marina area. A crewmember from another boat took the public bus around the island but didn't recommend it as an alternative. Some friends took a tour with a taxi driver and were quite impressed with all they learned about the island. The volcanic eruption of the mid-50s is documented in the cruising guides, but we didn't realize that a major earthquake, measuring more than 6 on the Richter scale, had struck in 1998 severely damaging many buildings in Horta. Fuel is available at the reception dock at the marina, and the price was comparable to what we spent in Fort Lauderdale. A tip we picked up somewhere was to buy your fuel when you check in and save the hassle of trying to get a place on the reception dock a second time. From Horta it's a short ferry trip to Madelena on the island of Pico. Pico is also the name of the huge volcanic peak on the island that is a landmark for miles and appears in the background of many photos of the marina at Horta. Many cruisers take the ferry and then rent a car to tour the island of Pico. Some even make the hike to the top of the mountain. That's what we did too (except the hike), and we were very impressed by the spectacular views from the cliff-side roads. But Pico also has decent anchorages, and next time we plan to sail around the island and visit some of the whaling museums and even a winery. The grape vines here grow along the ground rather than on trellises as we're used to seeing them in California and Oregon. One evening our neighbor on the inside of the raft-up mentioned that the Clube Naval had organized a regatta from Horta to Vila das Velas on São Jorge and all of the visitors in the marina were invited to join. We're cruisers, not racers, but when we thought about breaking up the raft to let our neighbor out, we decided that it would be fun to visit another island that way, so we joined too. It was great! We arrived in Velas to discover a festival in progress. We never did figure out what it was in honor of, but there are lots of festivals throughout the Azores in the summer. Our entry fee included dinner in Velas, which was served family style in a school cafeteria. Only three "foreign" boats participated in the regatta, so we were all mixed in with the local families. The food was quite good and very plentiful, and each boat received a bag of excellent local cheeses and cookies for their participation. After dinner we wandered through the booths lining the streets and watched the crowds of people. Later there was a rock concert on a stage in front of the marina followed by disco music until dawn. Yes, it was loud, but it was fun too. We think that fellow SSCA associate Neil McCubbin of Milvina won the open class of the regatta, but the announcement was in Portuguese, so we aren't sure. We didn't manage to see much of this island, but the town of Velas seems to be a beach resort. The cliffs were lined with tents filled mostly with young people, and we don't think they were there only for the festival. The marina at Velas wasn't mentioned in the books we had, but now that we know it's there, we're looking forward to a return visit. In Lajes das Flores, we stopped at the police station on the way up the hill to town, and they directed us to the Maritime Police next to the library. There our passports were checked-but not stamped-and we received a signed and stamped copy of our crew list to take to Immigration across the street and down a block. Immigration was manned by a member of the National Guard. He examined the stamped copy of our crew list and signed it too. That was it. Lajes is not a port of entry, he explained, but the Maritime Police and National Guard check visiting yachts in as an accommodation. The port of entry on Flores is at Santa Cruz where the airport is, but the harbor there isn't very sheltered, and yachts rarely visit. Our formal check-in and entry to the EU was at Horta, where Immigration and Customs are in the same building as the marina harbormaster. Visit the harbormaster first, then Immigration, and finally Customs. No one in Horta was the least bit interested in the document from Lajes. In Horta we received a document for foreign pleasure boats with a dated stamp, had our passports stamped, and were handed a brochure about temporary importation of the boat for 18 months without paying VAT. The transit log that used to be required for non-EU boats sailing between ports within the Azores and Portugal is no longer in use. 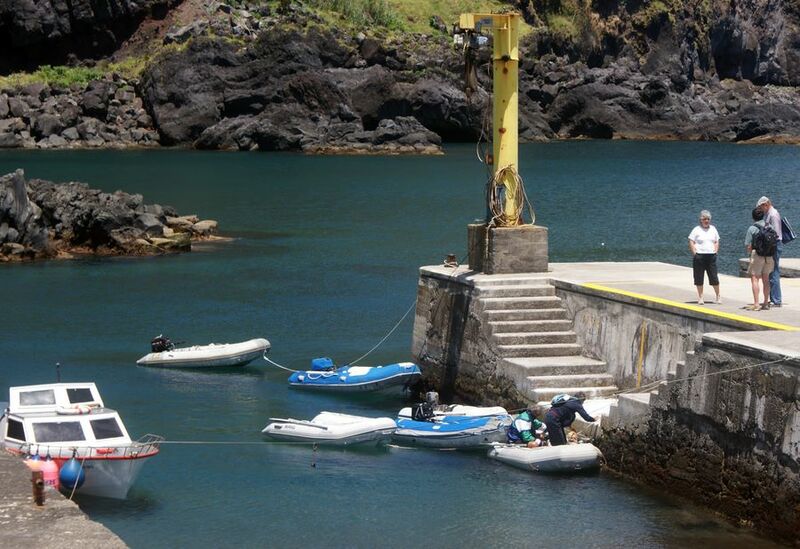 At Vila das Velas on São Jorge, we walked away from the boat without checking in at all. However, when John went back to find out what was delaying Neil from Milvina, he found that the port captain was checking entrance documents. The third "foreign" boat in the regatta was British, and its documents were not examined at Velas. We gather from this that non-EU boats do need to check in with each port captain, but it seems rather casual, and no one was able to explain what the rules were because they are in the process of being changed. The guides we had on board were Reeds Nautical Almanac 2008, which includes the Azores, and Azores Cruising Guide by World Cruising Publications, Jimmy Cornell's company. Both were useful in their way, but in retrospect, it would have been nice to have Atlantic Islands: Canaries, Maderia, Azores, Cape Verde by Anne Hammick. It's more recent than the Azores Cruising Guide (1993), and much has changed in the last 15 years! The price of Hammick's book put us off ($89.64 at Amazon.com when we checked), but we understand that updates are posted on the Internet, and that's big plus. Before we return to the islands, we'll make the investment. 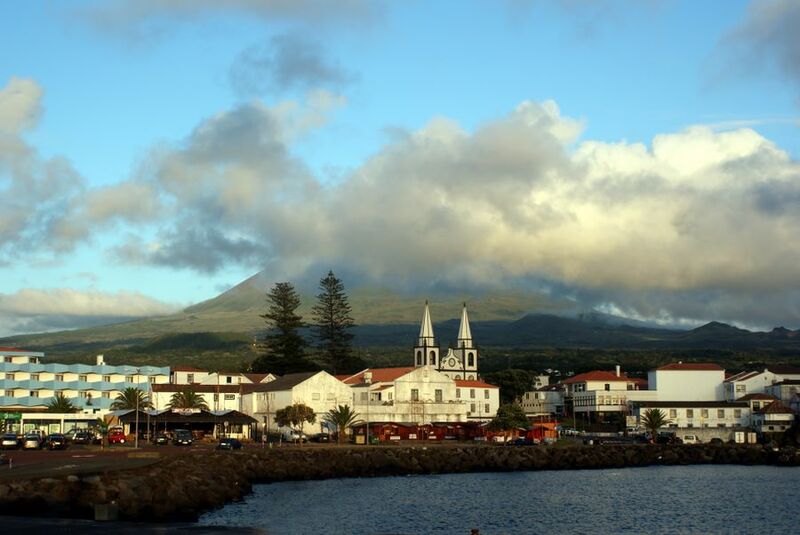 A good online introduction to the islands is the Azores Tourist Guide. In order to get some useful details into this letter, I skipped much of the raving that I usually do when I talk about the Azores. They are spectacularly beautiful, uncrowded and largely unspoiled by tourism. When we're ready to head west again, we plan to spend the whole season in the Azores before turning south to the other Portuguese islands and our eventual Atlantic crossing. Links to our photo pages from the Azores are below, and videos of our Atlantic crossing and some Azores footage is available from John's YouTube channel.